I recently found a recipe somewhere for some kind of shower moisturizer with just coconut oil, shea butter and beeswax. 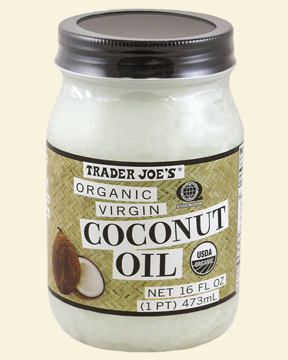 I’ve been shopping around for those things, but I really really wanted the coconut oil because I’ve heard you can moisturize as well as cook with it. I also love the taste of coconut and the smell… so I wanted some. I went to trader Joe’s and this was surprising cheap, only $6. I just finished making some muffins with it and I’ve used it on my hands (oh, a spill on the counter when cooking? let me clean it up with my hands and use the oil as lotion!) and my hair. I smell tropical. I still want to make that shower moisturizer (probably as christmas gifts) and I’m planning on making some granola with it as well!